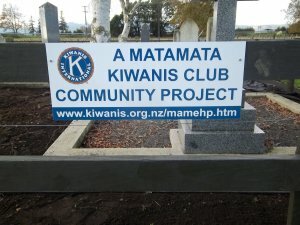 The Kiwanis Club of Matamata is a very active club providing time, energy and money to our local community, and to selected district, national and international projects. We have a very dedicated band of members willing to join in all sorts of activities to help others in need. In addition to projects, each year we provide marshals for the Firth Tower Fun Run, the Harriers Round the Streets Relay, and the Christmas Parade. Every two years we help with Pohlen Hospital's Garden Tour.We also marshall at events e.g. the Truck Festival which raised funds for Pohlen Hospital. We also help with collections e.g. Alzheimers Waikato and Child Cancer. The main source of our funds comes from battery recycling. 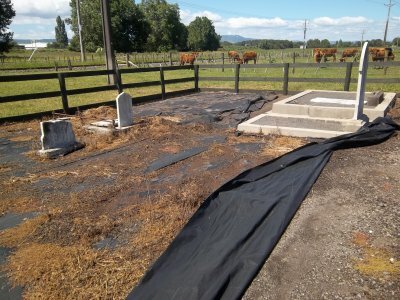 For a many years, the Matamata Kiwanis Club had talked about providing some sort of kiosk/map/plan of the plots at the Matamata Cemetery to help people find grave sites but couldn't come up with anything that would be vandal proof. 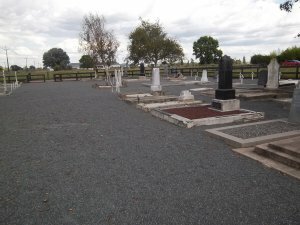 However, upon talking to Sheree O'Brien (MPDC) in early 2016, she explained that the council would be digitising their cemetery records, and people would be able to go to the cemetery and search for plots via the cemeteries section of the MPDC website on their phones or laptops (which is now a reality). 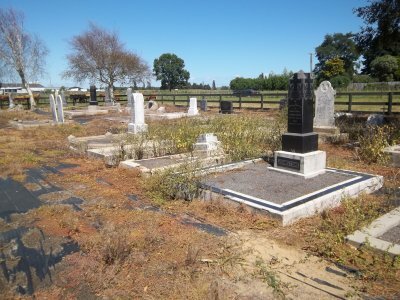 Sheree asked if we would be interested in tidying up the Waharoa Historic Cemetery. 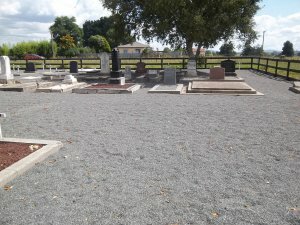 This cemetery has graves of many early settlers from around the Matamata and Waharoa districts. 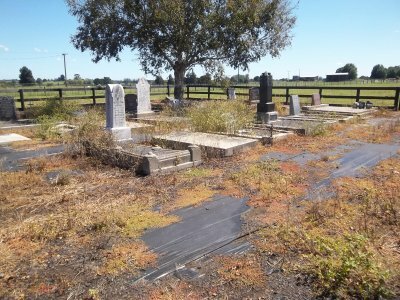 It was closed in 1974, and a fire raged through the cemetery around the same time, destroying wooden crosses that marked many of the graves without headstones. 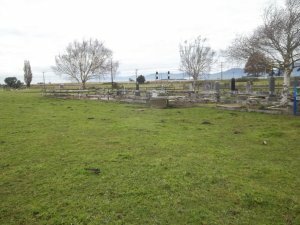 The cemetery has been in a state of neglect ever since. 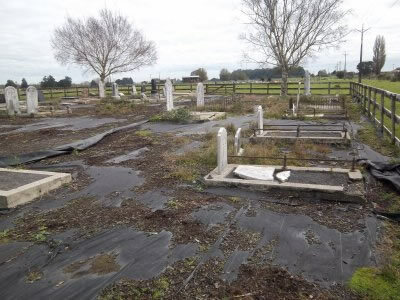 In fact we found references from as far back as 1906 lamenting the state of the cemetery! And then again in 1984! 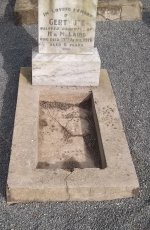 Unbeknownst to us, Justin Scelly (our current President) had a family plot at the cemetery (Scelly’s were the first burials at the cemetery in 1879) and had already been doing some work spraying weeds and headstones. As a club, we decided it would be a good ongoing project for us, and after consultation with MPDC via Bryan Turner, we began the restoration in mid 2017. 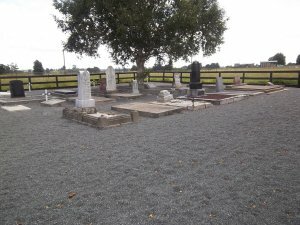 The first tasks were to finish spraying the weeds, spray the headstones (which were black and totally unreadable), and waterblast and paint the fence. 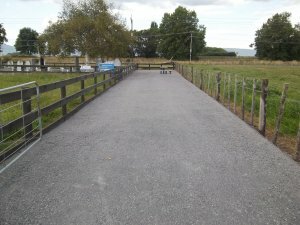 With these finished, we turned to removing the weeds, uplifting the weed matting, removing what bark chips were left, then relaying the ground matting (recycling where possible). Instead of using bark again, we decided to use small stone chips. All told, we shovelled and barrowed 56 tonnes of stone chips. 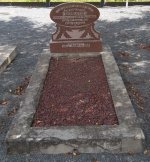 The next task was to remove any old stones on top of the graves, and replace them with 4 different types (in a random pattern) - scoria, coarse decorative pebbles, coarse river stones and coarse lime chips. 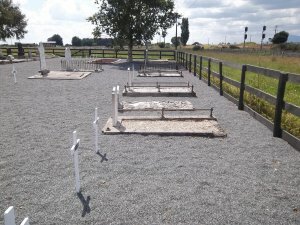 Not all grave tops had stones or could have stones. 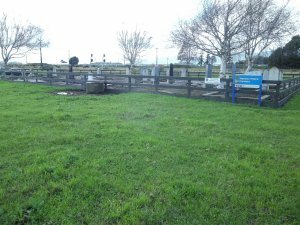 Our resident genealogists, Heather Bond and Sally Jenkins, have worked very hard reconstructing the layout of the cemetery and identifying where all the graves were and researching who was buried where (as there were no crosses). 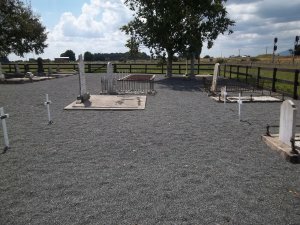 They have been very successful and nearly all gravesites are identified and named. It has been a huge job as the records were very incomplete with the change many years ago from a County Council to the District Council. 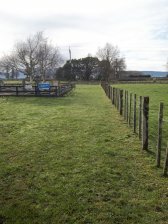 But they have been very resourceful scouring old records and newspapers on line, and with some valuable guidance from the Matamata Genealogy Club. There are only three people we know are buried in the cemetery but we don’t know exactly where, so their crosses are in a little group. 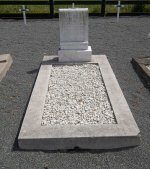 There is one grave (a child we think) which has “Unknown” on the cross as we have not been able to locate a name. 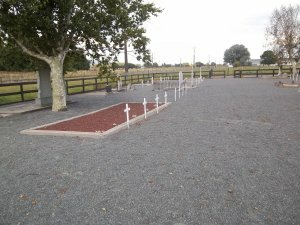 Some crosses only have a name as we have been unable to find dates of death or ages for them. 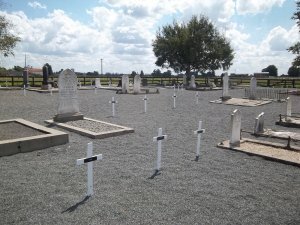 We have been able to provide 44 new crosses with various amounts of information on them depending on what records Heather and Sally could find. 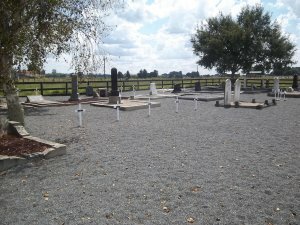 This is the first time since at least 1974 that the graves have all been marked. 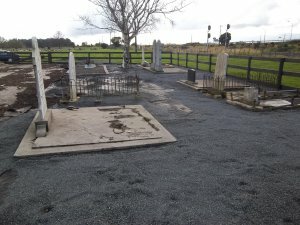 Next we extended the cemetery fence out to the road side so we could construct a track into the cemetery. 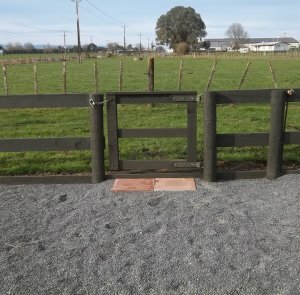 A gateway was built into the cemetery fence for pedestrian access. Then it was just a matter of clearing the pathway, levelling it and laying down gravel and rolling it. Lastly, a table and seats were installed and some plants will be sited near the seating. 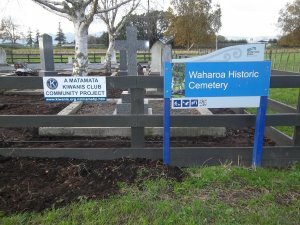 Matamata Piako District Council has provided some of the fence paint, some ground sheet, all the stone chips within the cemetery, stone for the entrance path and the spray for the headstones. 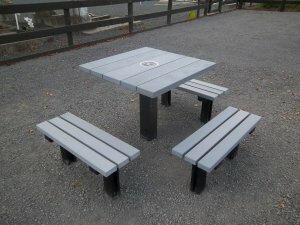 Kiwanis have provided paint, groundsheet, pegs, wood to fix the fence, wood to completely renew the bottom boards right round the cemetery, the wood for the extension to the road way, all the new crosses and plaques and shared the cost of the new seat and table the new seat and table. Of course we also provided our labour - over 700 hours in total! Below are the new pedestrian gate and table and seats. 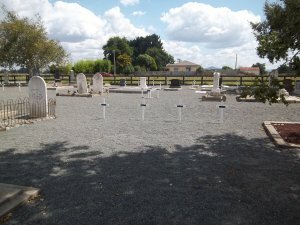 The project is now finished and a re-dedication will take place on March 23rd. 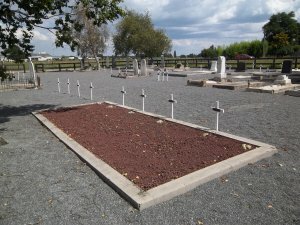 If anybody can help identify any of the unknown gravesites, or provide more details on specific graves (dates, ages etc. ), please feel free to contact us. Our donations of money and goods in 2018 totalled over $23,000.00 !! Our donations of money and goods for 2017 have totalled over $13,250.00 !!!! MONEY: Matamata Kidz Toy Library, Matamata Foodbank, Matamata Community Christmas Dinner, Matamata Friendship Circle (for Christmas gifts), Matamata Piako District Libraries Reading Programme, Kiwanis Golf Tournament at Walton, Autism NZ, Young Farmers Group (3 boys), Leukemia and Blood Cancer, Star Jam, Alzheimers NZ, Parkinsons NZ, Brain Injured Childrens Trust, Matamata Community Patrol, Fostering Kids NZ. GOODS: Pohlen Hospital (baby blankets - an ongoing project), Hinuera School (Terrific Kids library books), Walton School (Terrific Kids library books), Firth School (Terrific Kids library books), Vanuatu education project (furniture and books), Matamata Fire Brigade (set of emergency lights - the second set we have donated), Matamata Swimming Club (pace clock), Pohlen Hospital (television for the family room), knitting machines (to be used at local rest homes), Red Cross Matamata (shelving), Matamata College Junior Bowls set, Matamata Playcentre (3x tables), Matamata Intermediate (portable sound system), Threads Across The Pacific (sewing machines for Vanuatu). Our donations of money and goods for 2016 have so far totalled over $14.000 !!!! 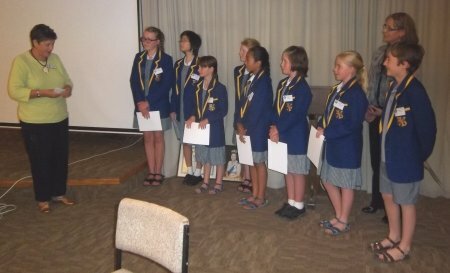 MONEY: Kiwanis Golf Tournament at Walton, Kiwanis Eliminate Programme, sponsorship of a student to Outward Bound, sponsorship of a student to the Globe Theatre (England), Child Cancer, Matamata College (Shakespeare Competition), Matamata Primary (amphitheatre), Autism NZ, Leukemia and Blood Cancer. GOODS: Pohlen Hospital (baby blankets), Hinuera School (Terrific Kids library books), Walton School (Terrific Kids library books), Pohlen Hospital (advanced shower chair), Vanuatu education project (furniture and books). Our donations of money and goods for this period totalled over $14,500.00. MONEY: Matamata Friendship Circle (Christmas Party), Matamata Library (Summer reading program), Rawhiti Kindergarten (Wharenui), Plunket Waikato (baby seats), Kiwanis Golf Tournament at Walton, Kiwanis Eliminate Programme, Student Camp donations, Alzheimers Waikato, Leukemia and Blood Cancer, Women in India (anti exploitation program), Matamata Foodbank x2. GOODS: Pohlen Hospital (baby blankets), Rawhiti Kindergarten (Wharenui), Hinuera School (Terrific Kids books), Plunket Waikato (baby seats), Pohlen Hospital (blood monitor), St Josephs School (computer tablets), Matamata Kids Toy Library (toys), Matamata Intermediate (iPad), Leukemia and Blood Cancer, Vanuatu education project (furniture and books). Our donations of money and goods for this period totalled over $17,500.00. MONEY: Matamata Friendship Circle (Christmas Party), Matamata Skate Park, Starfish (Youth Services at Matamata Intermediate), Matamata Library Summer Reading Programme, Matamata Foodbank, Kidney Kids, Kiwanis Golf Tournament, Te Poi School (Riding for the Disabled), Orlando Hansen (BMX), Matamata College (drama festival), Kiwianis Eliminate Project (an international Kiwanis project), Westpac Helicopter Trust, Child Cancer (Star of Courage donation), Matamata Intermediate (Doug the Digger programme), New Zealand Suicide Trust. GOODS: Pohlen Hospital (mobile recliner chairs), Vanuatu (school supplies), Matamata Fire Brigade (portable lights and tripods for use at accident scenes), Firth Primary (Duffy Books), Hinuera School (books on behalf of Terrific Kids), Pohlen Hospital (baby blankets). Our donations of money and goods for this period totalled over $21,000.00. Our main source of project money comes from our battery recycling scheme. 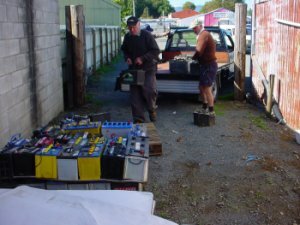 We are very fortunate to have the support of a large number of Matamata businesses who allow us to collect their used car, truck, tractor and boat batteries. We then put them on pallets, wrap and tie them, and on-sell them to a battery recycler. The other main source of project money in past years has been from woodchops. We purchased our own woodsplitter and seem to have no trouble finding trees to knock over! 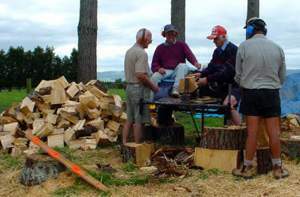 We always get a good turnout of members to help with chainsawing, splitting, loading and delivering. Caroline Mason, who recently became a member of the Matamata Kiwanis Club, is a keen quilter. 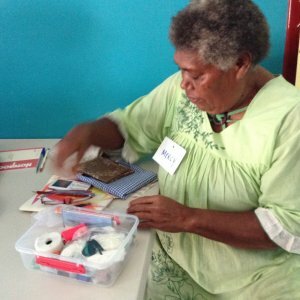 She was very moved by the plight of people in Vanuatu following Cyclone Pam in March 2015, and asked herself “what can I do”? She sought donations from fellow quilters, and found great support for the project, receiving donations of 741 quilts to send to Vanuatu. The second stage of the project involved donations of electric sewing machines, fabric and sewing supplies (over 100 machines have been donated from all around the country). Machines are all checked over to ensure they are in good working order before shipping. 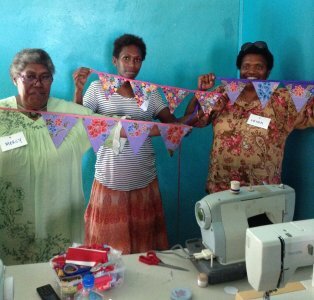 In addition to sending sewing machines, with the generous support of Kiwanis NZ-SP District, the project now involves sewing workshops in Vanuatu to improve the quality of sewing and ensure the recipients are taught basic machine maintenance. Caroline is assisted in delivering the workshops by a group of expat women in Vila. Without their help the workshops could not be delivered. “Threads across the Pacific” has a philosophy of giving a "Hand up, not a Hand Out". They teach women to sew quality garments for their families and to sell so they may contribute to the family income. In particular mothers and grandmothers need money to send their children to school. So the contribution of a sewing machine, fabric, or a cash donation is contributing to the education of the children of Vanuatu. Despite the best efforts of Caroline and her husband Julian (who checks out the machines), there have been problems with some of the older machines not working when they get to Vanuatu (probably from being in storage, humidity etc. ), so Caroline decided to try sourcing new machines to send to Vanuatu. In only two weeks, she has enough donations for 12 brand new machines to send early next year. This has been made possible by the generosity of Bernina New Zealand supplying the machines at a mighty discount! 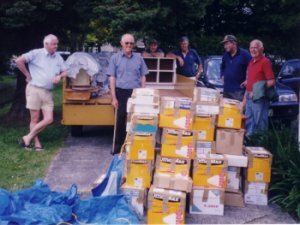 We collect educational books and furniture for students in Vanuatu. 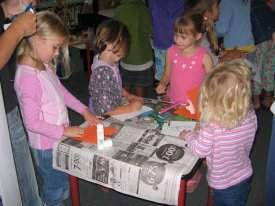 The books and equipment are donated by local schools, the books being either surplus to needs or outdated in terms of the NZ curriculums. School desks and chairs are refurbished (if needed) and sent over by container too. This is part of a national Kiwanis project. Pictured left are students from Matamata Intermediate School who have set up a twin program with a school in Vanuatu. Recently they came along to our meeting to tell us what they have been doing and what they have found out about their Vanuatu twins. Each year, as well as our on-going baby blanket project, we donate a piece of equipment to Pohlen Hospital. Over the last few years, we have donated a special hospital bed, 3 mobile recliner chairs, a baby heart monitor, and a blood transfusion machine. 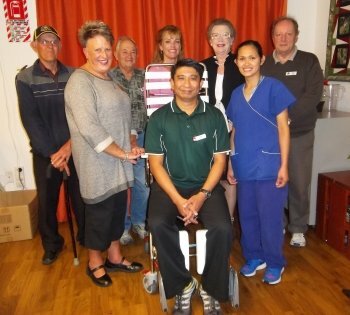 Recently we donated an advanced shower chair ($3400) to provide the best possible care for patients receiving palliative or end of life care which will minimise waiting times and ensure patients comfort and dignity at all times. Pictured (l to r): Allan Fairweather, Dianne Sinclair, Russell Sinclair (all Kiwanis), Liz Atherton (Pohlen Foundation), Gio (staff), Lady Margaret Spring (Chair, Pohlen Foundation), Lorraine (staff) and Garry King (Kiwanis). Terrific Kids is an initiative introduced by Kiwanis International with the word TERRIFIC an acronym meaning Thoughtful Enthusiastic Respectful Responsible Inclusive Friendly Inquisitive Capable. 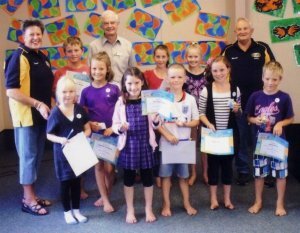 Once a term, certificates are presented to children in participating schools in recognition of personal achievement in areas such as character development, positive self-esteem and perseverance. 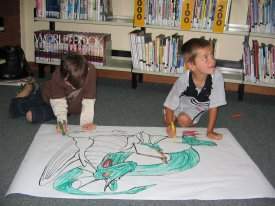 Each term, the school also receives $100 worth of library books donated in the students' names who were awarded certificates. Walton School has joined the programme and held their first presentations earlier this year. 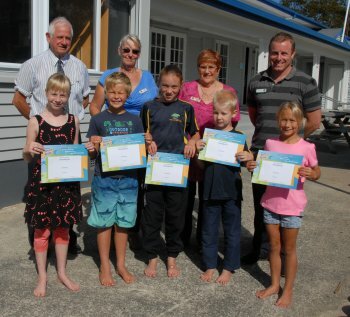 Pictured above are Principal Jeremy Kurth and students from Walton School who recently received certificates from Matamata Kiwanians Jim Kyle, Linda Patchett and Daph Wade. As well as Walton School, Hinuera and Firth Primary Schools also participate in thisd programme. 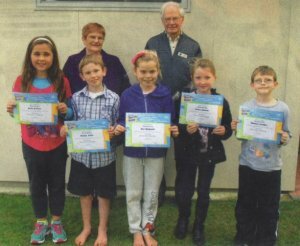 Pictured above are students from Hinuera School who recently received certificates from Matamata Kiwanians Dianne Sinclair, Ron Moles, Russell Sinclair and Daph Wade. Recently we donated money to the Matamata Fire Brigade to enable the purchase of two portable lights (with tripod stands) for use at accident scenes etc. The advantages of the portable lights are they can be easily transported close to an accident scene (e.g. over a bank, down a slope etc.) without the need for power cords snaking all over the place, and with long life batteries, they do not need a generator meaning less noise on site, allowing easier communication among the firemen and women. 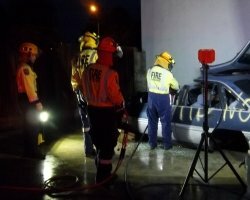 The Matamata Fire Brigade invited us to an evening where they demonstrated the jaws of life on a car wreck. 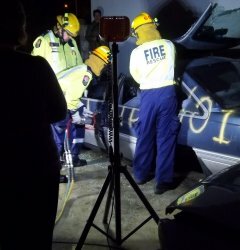 They began by demonstrating lights using a generator and then showed us the portable lights in use where they could be moved to any position in or around the car wreck. We are particularly pleased to support the fantastic work the Matamata Fire Brigade do around our town and district. 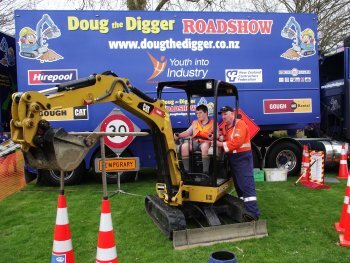 Recently Doug The Digger visited Matamata Intermediate for a careers day courtesy of funding from the Matamata Kiwanis Club. The one day programme focused on the value of education and how they can help in your career. Students had the opportunity for hands-on experience on a digger and a compactor and learnt about safety, safety checks, wearing the correct safety gear, listening, following instructions, being drug free and basic machinery maintenance. Students from the nearby Waikato Digger School (based at the Totaroaroa Road Quarry) were on hand to help Intermediate students and share their experiences. Perhaps some of the pupils may make their career in this industry! 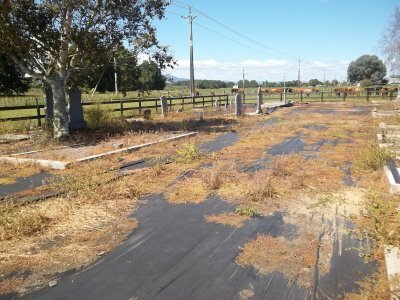 Nearly 25 years ago, the Kiwanis Club of Matamata planted a large number of magnolias in what is now known as the Neil Algar Reserve. At last a sign has been erected acknowledging our contribution. 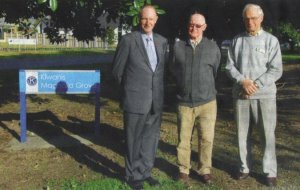 Pictured (l to r): Hugh Vercoe (Mayor - MPDC), Tom Troughton (Kiwanis President) and Ron Moles (Master Gardener). 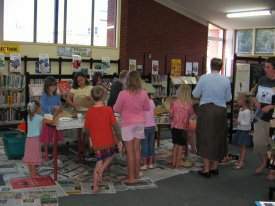 Each summer, along with the Morrinsville Kiwanis Club, our Club provides funding for the Kiwanis Summer Reading Programme - Reading is Fantastic - run by the Matamata Piako District Libraries covering Matamata, Morrinsville and Te Aroha. 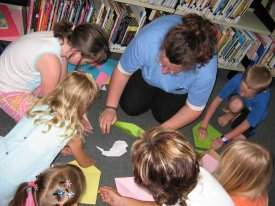 It is a family oriented reading incentive programme for children from five to pre-teen run in the three libraries over the summer school holidays, with a focus on encouraging literacy. Children register for the programme and then check in three times to report on their reading. At each reporting session children are rewarded with a small novelty incentive, culminating in an end of programme day out with activities and presentations.